Mark's Tickets is the best place to find tickets for Los Angeles Angels of Anaheim fans. Just check this page for any new events or schedule updates throughout the year. We sell tickets to every Los Angeles Angels of Anaheim game around the world. We know how passionate Los Angeles Angels of Anaheim fans can be about baseball, so we make sure to have hundreds of tickets for every game available right up until it starts. For those looking for cheap Los Angeles Angels of Anaheim tickets, we offer tickets starting at very low prices (many times below face value). We offer tickets in most sections of every venue that you can see Los Angeles Angels of Anaheim. Simply choose the city or venue that you are interested in below, and you will be able to see all of the available seats. Do not forget that Marks Tickets also specializes in sold out Los Angeles Angels of Anaheim tickets. No longer will sold out shows prevent you from seeing Los Angeles Angels of Anaheim. The Los Angeles Angels of Anaheim are a professional baseball team that plays in the MLB. 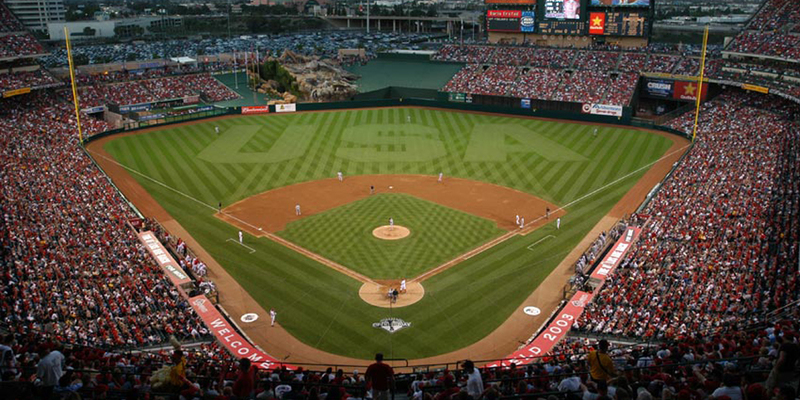 The Angels play their home games at Angel Stadium of Anaheim in Anaheim, California. With 162 games per year, and 81 being home games, The Los Angeles Angels of Anaheim are a professional baseball team based in Anaheim, California, United States. The Angels are a member of the Western Division of Major League Baseball's American League. The "Angels" name is a tribute to the previous Los Angeles Angels who played in South Central L.A. from 1903-1957. The Angels have been based in Angel Stadium of Anaheim since 1966. The Angels franchise of today was established in the MLB in 1961 through Gene Autry, the team?s first Major League owner who bought the rights to continue the franchise name from Walter O'Malley, the former Los Angeles Dodgers owner who acquired the franchise from Phil Wrigley, the owner of the Chicago Cubs at the time. In 2009, the Angels were AL Western Division champions for the third straight season. 2012 marked the tenth straight year in which the Angels franchise had drawn more than three million fans in attendance for the regular baseball season. In 2011, ESPN ranked the Los Angeles Angels #4 on its list of Ultimate Team Rankings ahead of every team in baseball and any franchise in Los Angeles.